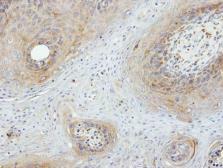 Specificity/Sensitivity : This antibody is raised against JNK1/2 phosphorylated at Thr183/Tyr185. Based on sequence homology, it is predicted to react with JNK3 when phosphorylated at the corresponding residues - Thr221/Tyr223. 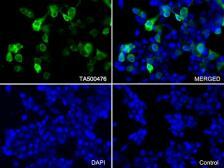 The antibody has been shown to recognize the endogenous, active forms of JNK 1 + 2 in a variety of cell types following treatment by a broad range of extracellular stimuli [e.g. 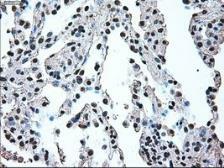 including 293 cells (human embryonic kidney; +/- ultraviolet light) and PC12 cells (rat pheochromocytoma; +/- sorbital)]. 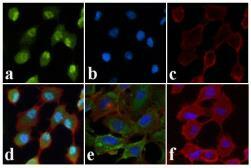 Specificity/Sensitivity : This antibody is raised against JNK1/2 phosphorylated at Thr183. Based on sequence homology, it is predicted to react with JNK3 when phosphorylated at the corresponding residues - Thr221. Specificity/Sensitivity : The antibody will recognize full-length Caspase-1 and cleaved caspase-1 forms that retain amino acids 371-390 of the Caspase-1 protein.